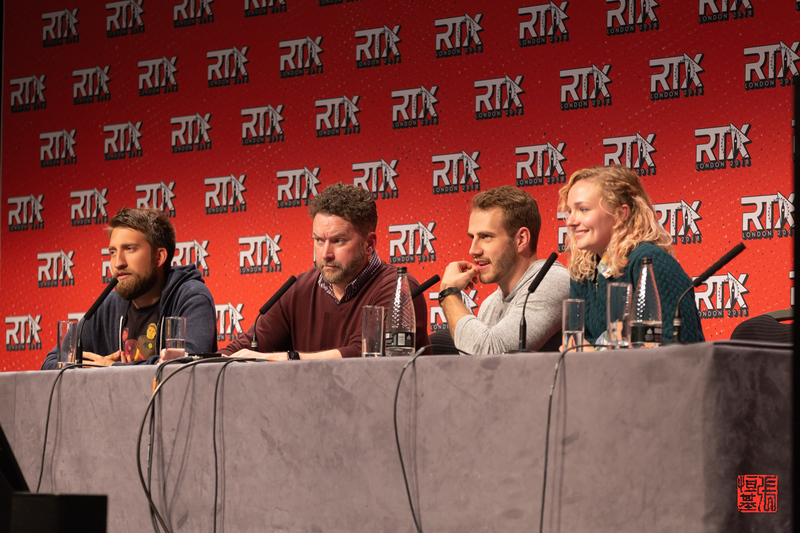 RTX London is an event hosted by the Rooster Teeth who have many franchises such as Red Vs Blue, RWBY, Achievement Hunters, FunHaus, Camp Camp and many more. The event is held at ExCel in London and this is it’s second year being hosted in the UK. How the event is structured, you have your usually geeky stalls, games to play and mechanise store. But also there are panels to attend. Three panels were setup for all their franchises to host. Most of their biggest shows had a panel, even “On The Spot”. Rather then talk about the event and what stalls were there, I thought I talk about the panels I attended. I do like their panel format where they give a main presentation with an opportunity to have a Q&A with the hosts. RWBY is an American anime-style web series based around four girls who have combat abilities in a world called Remnant. Last year we were treated to a showing of the trailer and then the first episode of volume five. This year however, we only got told of exclusive news regarding it’s show and IP’s it has attached to it, such as video games, manga, etc. 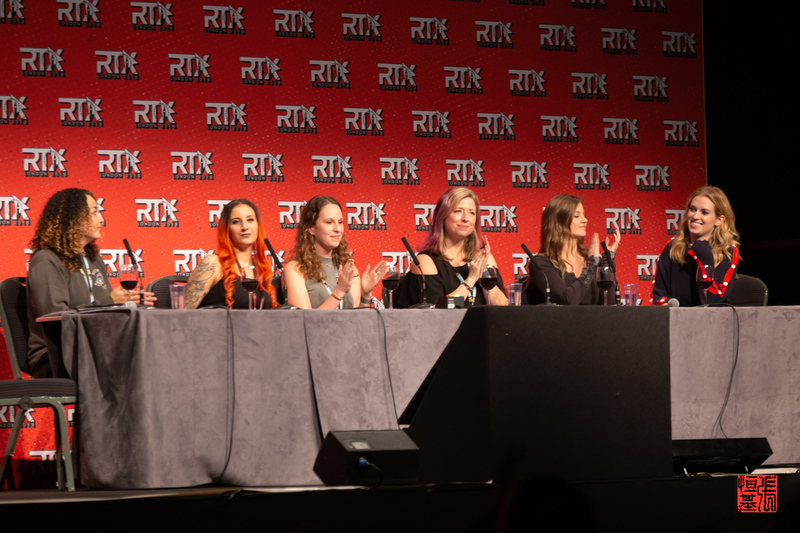 They had the the head of the Animation Dept and voice of one Torchwich from RWBY Gray Haddock, Lindsey Jones voice of Ruby Rose, Barbara Dunkelman voice of Yang Xi Long and Anna Hullum voice of Raven Branwen. This was probably disappointed to not see actual footage of the up and coming volume six as we were given a whole episode episode last year. But as there is over a month away from the premier date, I’m assuming they didn’t want to run the risk of a leak. But in exchange, we got to see a preview footage of their new show Gen:Lock which looks awesome. A name change for the UK audience from there show “Million Dollars but,…“. It’s based off the hypothetical question, “What (dare/bet challenge) would you do for a million dollars?”. I thoroughly love this show and was very excited to attend this show. It was hosted by Burnie Burns, Gavin Free, Blain Gibson and Ellie Main. They started the panel with giving each other MPA/MDB scenarios to warm the crowd up before it was opened up to the audience. There was some great suggestion to the panel to discuss over and answer if they would take the money. Rooster Teeth have an array of animation projects from Camp Camp, Nomad of Nowhere, Red Vs Blue, RTAA. I don’t watch many of their animation show so was curious to know what news they had. 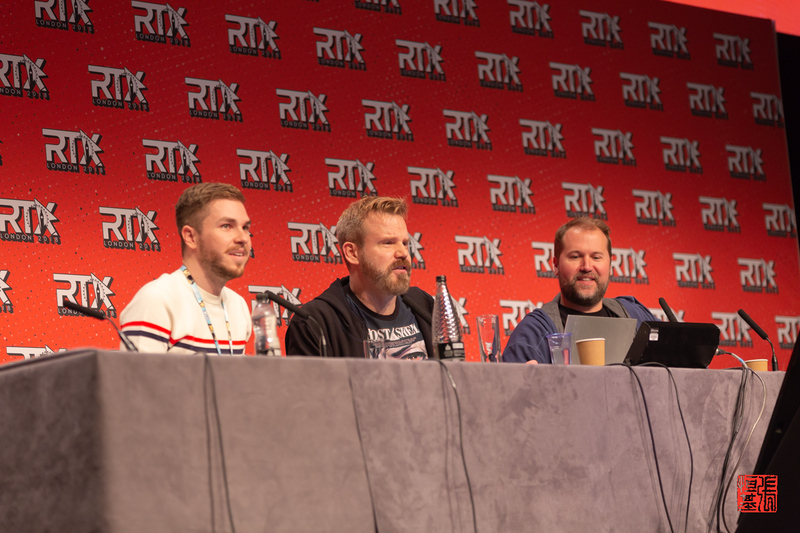 They started off with showing us with the latest of episode of Nomad of Nowhere and then an exclusive clip of their RTAA (which I love to watch whilst on the toile…..bus, I meant bus). But their big announcement was again, Gen:Lock but with a different announcement that Maisie Williams will be joining the star studded cast list of this show. I really enjoyed this panel as it gave me into an insight into show I don’t usually see. And getting extra new about Gen:Lock has really got my pulses running. If you are able to find any footage of Gen:Lock I really would encourage it. 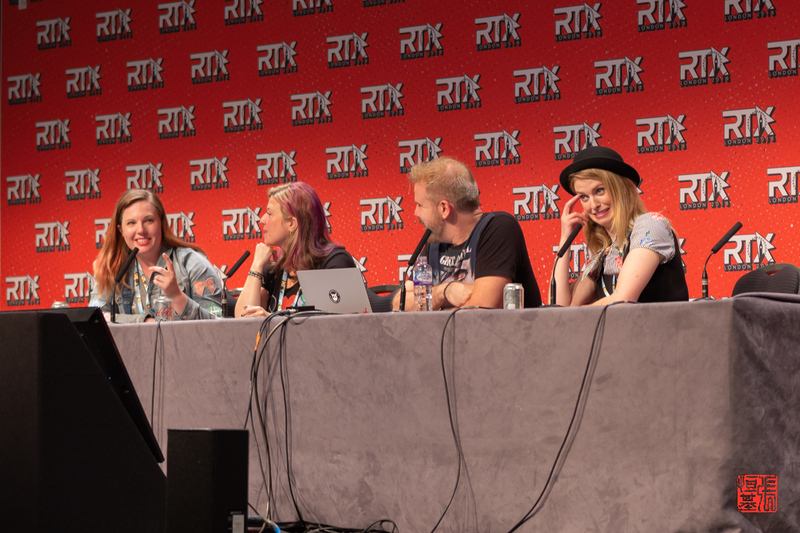 Host by the lovely Barbara Dunkelman, joined by Ashley Jenkins, Blaine Gibson and Tim Gettys. This show is more about social aspect of life and getting advice about life issues. Barbara opened with a quick fire intimate questions from the match.com questionnaire to her panelist as well as to herself. This was very amusing to hear the quick answers and then a longer review of them. Next part was to open up the panel to the audience and again, the audience ran up to the microphone, ready to ask for their advice. Their answer was open, without judgement and honest. If they weren’t able to answer it, they would say so. This was a panel to help promote the diversity of women in job position in the RT company and demonstrate that such barriers do not exist. And it really shows, they had a video showing some of the women of RT who contribute to the daily running. The panelist was from all departments of the company both in front of the camera and behind it. 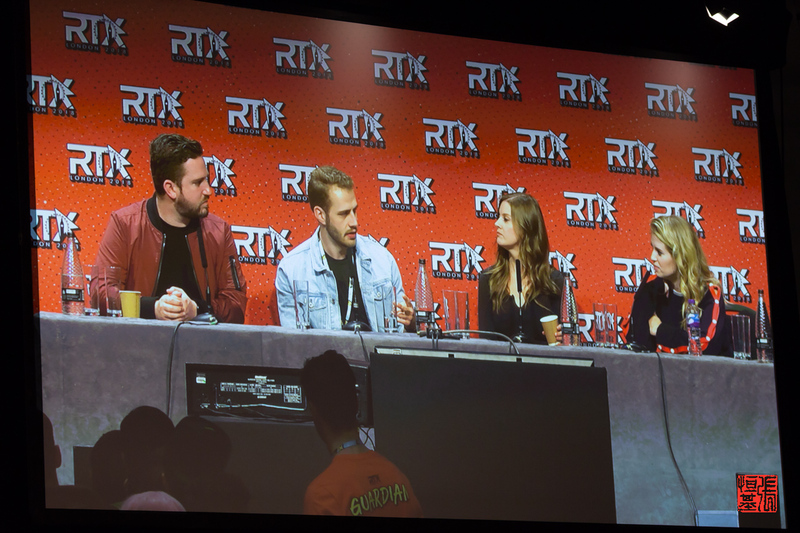 After listening to personal accounts on how RT have helped them be more involved, the panel was opened up to the audience to ask the panel questions. This was such an inspiring panel to listen. Listening to many people’s point of view and struggle some other people still go through today. Some great advice given for everyone to take away. The main hall was of similar size to last year with a main stage for anyone to attend. An area for the signing from the RT personalities. RT store was popular as on Saturday, the queue was so long, that it remained like that throughout the day. The stalls around the hall, was nice and varied from artwork, digital games, tabletop games, merchandise and more. My only issue is, that I wanted more stall there or activities if you are unable to attend the panels cause of the capped queues. I have to say, the guardians were just a delight. They were so helpful and always wanting to help you with most of my needs. They were just so entertaining to talk to and always had a smile on their faces. The guardians really help make sure the event go without a hitch. And if there was a hitch, they really made sure we as attendees did not know about it. To see the full gallery of cosplay photos taken at the event here, click on the links below.